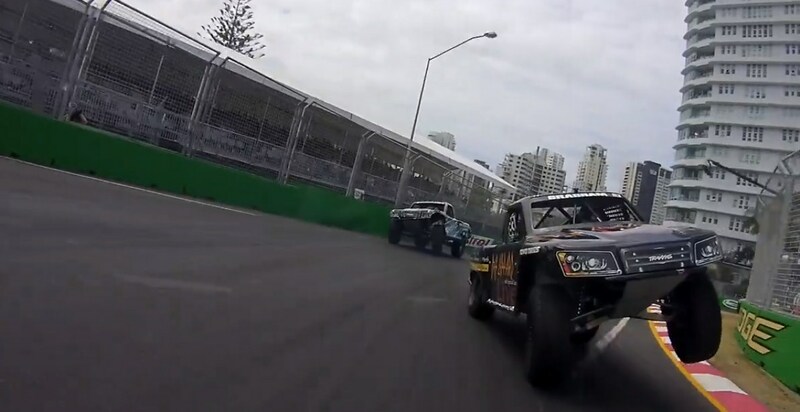 Matt Brabham Tries To OVERTAKE Paul Morris’ TRAXXAS! We have always been fascinated by videos that are recorded from the driver`s point of view or at least from a camera mounted on the vehicle itself. These kinds of perspectives just bring the thrill even closer than it actually is! Therefore, the excitement is taken to a whole different level! Anyhow, the video we have prepared for today is recorded exactly by such camera (produced by Replay XD) mounted on the back of Paul Morris` vehicle and it captured all the action that was occurring behind this racing vehicle. More precisely, you are going to see how Matt Brabham is trying to overtake The Dude! Matt comes so close to Paul that makes this whole situation look unreal! Like in a video game! But for us, the most amazing part from this video is when these vehicles jump of the ramps several feet in the air! To us, they seem like wild animals jumping towards their pray! And that`s not all! Pay attention what`s happening to the vehicles that are in the focus when they the drivers push the pedal to the metal. They drive on three wheels! At last, click here to watch the best diesel drag race ever done! Cummins vs Duramax!